Community participation plays a large role in the success or failure of our public schools. This book focuses attention on the problem of inequality in public engagement, considering how race, class, ethnicity, language, and immigration status shape opportunities for engagement. 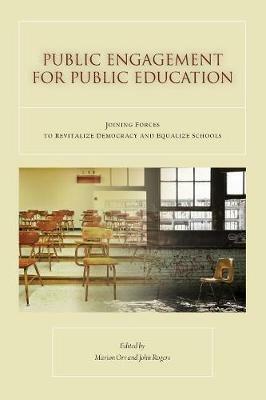 Without the active participation of the public, chances for improving school systems are limited. Without equal opportunity for public engagement, those in the lower reaches of stratified society are left largely on the outside looking in-and that all too easily becomes a self-perpetuating cycle. Public Engagement for Public Education speaks to the potential for students, parents, community members, and civic leaders to join forces and create more equitable schooling. Such engagement can expand access to quality educational pathways which in turn paves the way to a stronger voice in society and the promise of the American dream. If segments of society are blocked access to those pathways, the book argues, nothing less than the health of American democracy is at stake.